Ochsner Journal premiered in January 1999 with a simple green and white marbled cover. Since that very first issue, the Journal’s content has not only evolved but it also generated six notable cover designs. The current cover of Ochsner Journal debuted with the winter 2006 issue. The simple design includes the Academic Division’s seal. The seal has a portrait of Dr. Alton Ochsner, scientists, and educators, all of whom portray that the division is a national leader with a global impact. Over the next few years, the cover’s branding remained the same with a few special tokens added here and there. In the summer of 2011, the Journal became the Official Journal of The Ochsner Clinic Foundation and The Ochsner Clinical School of The University of Queensland School of Medicine. This prestigious honor warranted a badge placed in the lower left corner. In 2012, the Journal adopted a yellow banner in the upper right corner to announce different theme of the issues. 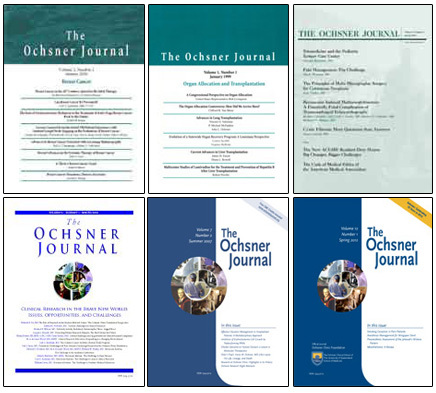 Whether it is the original marbled green cover or the Ochsner blue and gold cover let the editorial staff know which one you like the most in the comments section. Who knows – you may impact future decisions of a cover update.